Kirsten Schwarzer, Certified nutrition coach and passionate foodie. At www.radiantbodyco.com Kirsten shares how to cook simple, healthy & flavorful food with your busy life. With the year picking up speed, I find myself needing more assemble-only recipes that don’t require any mental effort or stove time. That’s why I love this Greek lentil salad. It’s hearty, flavorful and takes less than ten minutes to put together. 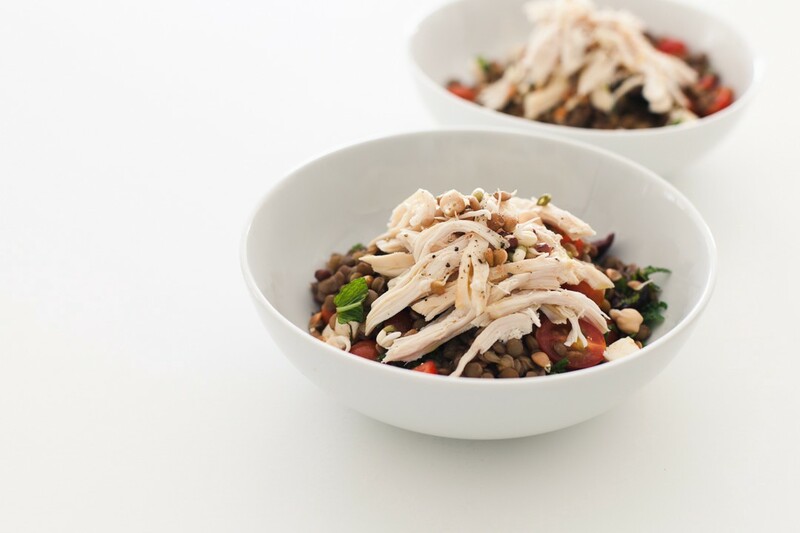 It stars two of my favorite ingredients for eating healthy when I’m crunched for time: rotisserie chicken and canned lentils. Canned lentils are the perfect smart carbohydrate to add to your meals when you don’t have an hour to steam brown rice or roast sweet potatoes. All you need to do is place the lentils in a strainer and pour a kettle of boiling water of them. This removes the preserved taste and also warms them slightly. You can easily double or triple the recipe to make it ahead for a few days. Boil a kettle of water. Then place the lentils in a strainer and pour the boiling water over them. Chop cherry tomatoes in half, cube the feta and slice the olives in half. Remove the mint leaves from the stems. Roll the leaves into a small bunch and slice as thin as you can. Add the all of the salad ingredients and cooked lentils into a large bowl and mix. Make the dressing by combining the olive oil, lemon juice, red wine vinegar and sugar in a small mason jar. Add salt and pepper to taste. Close the lid and shake vigorously until the mixture combines. To serve, divide the salad into 2 small bowls or resealable containers if you’re packing this as a lunch. Top off your salads with a few pieces of rotisserie chicken breast and crunchy bean sprouts. Drizzle 2 teaspoons of dressing over each bowl and season with salt and pepper.